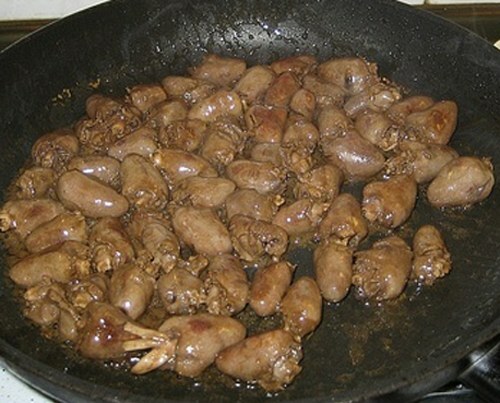 Chicken hearts is healthy, nutritious and delicious by-product. They are cheaper than meat, but in nutritional value and taste does not concede to it. This byproduct can be cooked first and second courses, and even salads. If you are short of time but want something hot and hearty, roasted chicken hearts – the best way out. 1/2 teaspoon crushed chili peppers. Roast chicken heartscompletely Defrost chicken hearts. Rinse thoroughly under running water. Remove the thin transparent film. Heat the pan with vegetable oil and place the hearts. Fry for 5-7 minutes. When the hearts formed a crust, pour half a Cup of water and simmer for 15-20 minutes, stirring regularly. Ensure that the hearts should not be burnt. Time to add some water if it evaporates quickly. Peel the onions and carrots and cut into thin half-rings. After the water from the pan almost all evaporated, add 2 tablespoons of butter and pour into the pan of vegetables. Stir and cook another 5-7 minutes. Season with salt, add seasonings to taste. With chicken hearts, goes well with curry. Remove from heat and serve hot. For a side dish you can serve pasta, white rice, and fresh vegetables. Carefully setacceptmode spicy fried chicken hearts, remove the tape and cut it into two parts. If the hearts are large, then into four parts. Pour in boiling salted water. Cook over moderate heat for half an hour. Peel onions, carrots, sweet bell pepper and garlic until the hearts are cooked. Cut the vegetables in small cubes or strips. Preheat a deep frying pan butter and pour all vegetables except garlic. Cook over high heat, stirring constantly, for 5-7 minutes. Remove the pan from the hearts from the heat and drain all the water. Pour the boiled hearts on a clean, dry towel and let them dry for about 5 minutes. Pour the dried hearts in the pan with the vegetables. Add salt, ground red chili pepper and chopped garlic. Stir and fry for 2-3 minutes. Remove from heat, cover and allow to stand for about 10 minutes. Serve as a garnish to roast boiled potatoes or any porridge.